New Ruffies PRO™ Duct and Masking Tape Line Delivers Quality Adhesive Products for Consumer Household Applications | Berry Global Group, Inc.
FRANKLIN, MA, October 8, 2008 – Berry Plastics Corporation is pleased to introduce Ruffies PRO™ tapes, a new consumer line of quality-based, high-demand adhesive tape products. Ideal for household or office applications, the line offers an all-purpose utility duct tape product and a variety of masking tapes. The tapes will be carried by a broad base of stores, including large, medium, and small retailers, as well as hardware and grocery stores. Ruffies PRO™ Utility Duct Tape is an all-purpose duct tape with high-tack for secure bonding to a variety of smooth and rough surfaces. It can be used for repairing, sealing, patching, bonding, and bundling. Its flexible PE backing provides excellent conformability to irregular surfaces and shapes. This high-use product is certain to be the choice of consumers and will be a hit for home, office, automobile, and garage use. 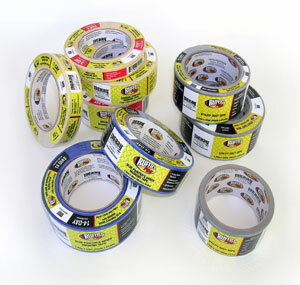 The comprehensive masking tape line, Ruffies PRO™ Masking Tape, features product for the three highest demand home and do-it-yourself applications: general purpose, multi-use, and blue painters. A variety of widths and sizes has been manufactured and are available for immediate shipment. “Ruffies PRO™ is a nationally established economy brand and a leading value choice of consumers and DIYers. By extending the product line to include quality adhesive products, consumers now have tape choices that boast equal - even better performance - than the more expensive market leaders,” states Mr. Ernie Giordano, Retail Marketing Manager for Berry Plastics – Tapes and Coatings Division. The Ruffies PRO™ tape packaging is eye-catching and descriptive and provides a unique on-shelf presence amongst the other tape products. Each roll is individually film-wrapped for easy display. Additional display vehicles are available for on-shelf and in-store promotions to retailers. For further information please contact Ernie Giordano at erniegiordano@berryplastics.com or by calling 508.918.1684. Berry Plastics is a leading manufacturer and marketer of plastic packaging products, polyethylene-based plastic films, industrial tapes, medical specialties, packaging, heat-shrinkable coatings and specialty laminates. Berry Plastics provides comprehensive packaging solutions to over 12,000 customers, ranging from large multinational corporations to small local businesses. It is also one of the largest producers domestically of trash bags, duct tape, and niche laminated and coated products. Among its leading brands are Ruffies and Rhino-X trash bags; Film-Gard plastic sheeting; Nashua tapes; Covalence Raychem heat-shrinkable coatings (Raychem is a trademark of Tyco Electronics Corporation and Nashua is a trademark of Nashua Corporation; each are used under license by Berry Plastics); Polyken pipeline coatings; Thermo-ply and Energy-Brace wall sheathing; R-Wrap and Barricade house wraps; and its charitable giving brand iCommit, dedicated to supporting fund raising for cause-based programs. The Company is based in Evansville, Indiana with more than 13,000 employees worldwide.